Each topic and each general idea within the topic is presented by a Resource Card, specific Worksheets and Spreadsheets that can be used in incorporating the activity in the class. Each Resource Card provides a general description of how to use the Worksheets. The Spreadsheets may be ones that are provided for students to work with as they work on the presented problem. All of these spreadsheets contain solutions that are hidden that can be displayed using Format->Sheet->Unhide. The solutions are one method to provide an idea of the intent of the activity. Some spreadsheets are simply solution spreadsheets and not intended to be given to the students. The students are expected to design the spreadsheet on their own. The presentation of the activities has been purposefully designed to build student skills with spreadsheets as mathematical exploration and problem solving tools. The ideas for the problems are a combination of problems and data found in the Connected Mathematics Algebra 6-7-8 by Lappen, Fey, Fitzgerald, Friel, and Phillips and published by Dale Seymour Publications, 2002. These problems that we have designed provide ideas for how you might incorporate spreadsheets with the problems you find in these books. We have often embedded them within the context of Dash, Violet and their Increbile parents. Feel free to make changes in these names to better suit your students. If your students have never used spreadsheets before you might consider beginning with the 4_M&M_activity.doc activity (found in the Rational numbers: Ratio, Decimal and Percents of section Numbers). Numbers provides an introductory unit to spreadsheets, where students are able to learn about the basic features available in spreadsheets while also investigating the difference between theoretical and experimental probability. 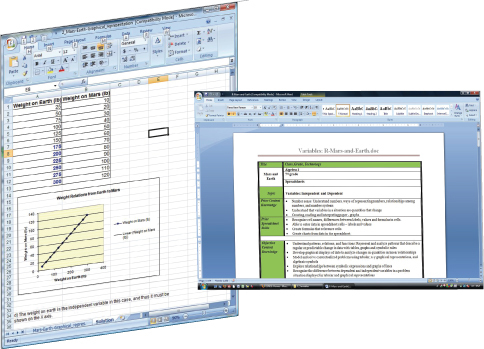 Detailed descriptions are provided in this activity that integrates learning about spreadsheets within a mathematical context. You can also download the entire set of curricular ideas in zipped form here.